The AIM NetworkNews and PoliticsTurnbull snatches defeat from the jaws of victory. We need more journalists like you brave and gutsy, great article a government in the SPOTLIGHT, highlighting a very crooked PM and his team of idiots and the chasing down and trampling on any labor minister In their way with the help of one stream media there is no main stream only the one that’s connected from LNP to Murdochs bank account now that Fairfax is crushed. CUBBY STATION wow just saw the Arial shots it has more water than the mighty rivers it feeds off what a catastrophe. OK, so graziers who overstock beyond the capacity of their property to feed the livestock are rewarded for their greed with government subsidies of about $190 MILLION, or about $16,000 PER PROPERTY. This is just free money for the Rich and Greedy; Asset Rich and wanting to hold the properties that generate effortless capital gain for retirement, the short term stock losses are socialised for the long term financial benefit of the landholders. In the 1983 drought a very experienced old neighbour laughed when I said I was searching for hay. “Who has the money at the end of a drought?” he asked rhetorically, before answering, “The cocky who was smart enough to sell off early in the dry, bank his returns and sit it out, to re-purchase in a flat market after it rained”. Good advice I have followed since. Now how much do the unemployed on JobStart receive in the cities, or age pensioners struggling to keep warm in dark houses thanks to LNP privatisation of state electricity assets , or NDIS recipients …. compared the the Parliamentary Allowances Scheme available to politicians??? If I could only access one writer for my coverage of Australian politics it would be you David. Wide ranging and accurate. Excellent. @Vixstar: Cubby Station pay about $6,000 per year for the water rights. Over a number of years, the property has been developed so that embankments have been built that hold all the water that falls on Cubby as rain, stays on Cubby. This has been a legal land improvement, and even may have even subsidised by government grants. In the 1990s, the Queensland government unsuccessfully attempted to break the Cubby hold on water supply that correctly should have flowed down the MDB. At that time, the PM of the time agreed, then back-flipped, under pressure from a late media magnate who had an interest in Cubby. The MDB will suffer from water theft while-ever water licences and extraction pumps are free from 24/7/365 satellite surveillance with seriously severe water pumping penalties during cotton boll-filling period for offenders who interfere with the monitoring devices. In the past, these broad acre farmers in NW NSW believed that leaving the defoliant sprays on while the crop-duster flew over town, defoliating town gardens, was a satisfactory practice. Now each crop-duster has monitoring device that plots all flights and can hold offenders legally and financially responsible. Full of the diversions that allow ‘forgetting’. Are there no usable method of re-enforcement available to labor? Ben Orquist director “Everyday Australians would be appalled to know that the annual company tax saving for just one company could pay for 7,610 teachers, 8,450 nurses or 6,310 police officers,. That might make a slogan?? But there are a ‘plethora’ of slogans that could excite the morning shows with an excitement?? Slow release or one each mon and wed??? Cubbie Staion, predominantly owned by Chinese interests, currently has right to pump up to 450 thousand million litres from the Culgoa River, one of the major northern feeders into the Darling (+ Murray) river system. This is the greatest allocation granted to any agricultural irrigator in Australia, mostly going towards the growing of up to 240,000 Ha of flood-irrigated export cotton. Here is a newspaper article (by Helen Vivian) that gives a fairly accurate overview of the overall practices of cynicism, greed and outright corruption that are causing the drying death of the Darling River. Ps, Superb article, David Tyler. A rather clumsy hug from Mal, the huge stiff hats got in the way…. Hey David Tyler, I’ve nothing to add – you’ve said it all. I love your writing & I think you’re brilliant. Get it to a greater audience, quick smart! I grew up surrounded by the Darling,Macquarie and the Lachlan even then the cotton crops where coming closer and closer to towns,the embankment going for miles with the stocked water pumping out of our river systems. 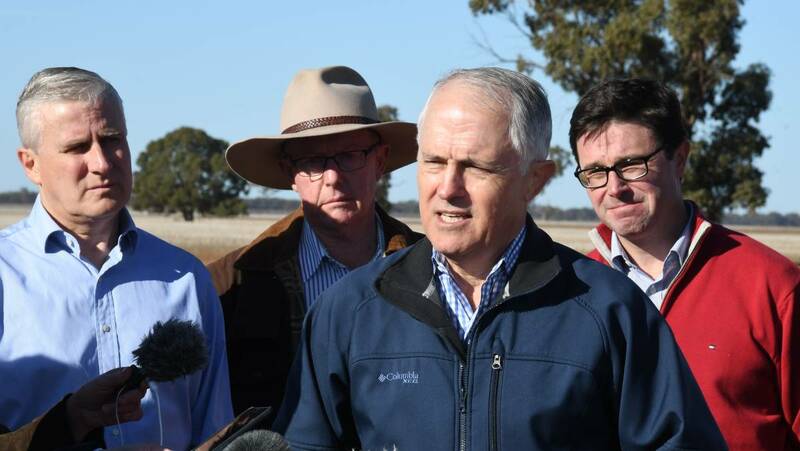 That was 30 years ago and by looking at the photo of Cubbie and the one on “Dont blame me i didnt vote Liberal” “MALCOLM lies and champagne cliches” the magnitude is horrendous the poor independent farmers snd there communites, its like seeing the start of Americas Dustbowl of the 1950s . Great read and truly damning indictment of this rotten government led by a dickhead PM. Well done and hope to see some MSM follow suit. Wow, what a read, thanks David. A very good sum up. ….and what a brilliant title for the post! Thank you David Tyler … I enjoyed reading your incisive analysis. Your article brought to my mind a book written in 1988 by Noam Chomsky ( of whom you are probably aware ) , and a fellow scholar, Edward.S. Herman and titled ” Manufacturing Consent ” . Toward the end, the interviewer suggests there is a move to form a ‘ conglomerate ‘ of like outlets with the view toward forming a sizable force of untainted news for general consumption. ‘Funny’ that you mention the US dust bowls. I worked out on the lower Gwydir/Barwon country back in the early 90’s, when the various cotton concerns were only partway through their process of acquiring every viable scrap of fertile black-soil plains. Back then the chief players seemed to be US consortiums, like the Boswell group (operating as ‘Auscott’). Consensus amongst those who looked beneath the name was that part of reasons the US concerns had shifted their terra-rapacious operations to Australia was due to the exhaustion of soil and water resource in their own domestic cotton belt. Of course, since then, in accord with general shifts in political and economic power, the biggest new players in the cotton game seem to have come from China, where industrial agribusinesses often operate with hidden state backing. I am not convinced that either the short term viability of downstream farms nor the long-term health of the Australian environment are significant concerns for overseas corporate stakeholders. You can just bet that if they were in power they wouldn’t do it if the opposition made the same suggestion. They would decry that it’s all a political stunt. “Cutting company tax will reduce revenue available for community services and productivity enhancing public infrastructure.” Pure LNP!